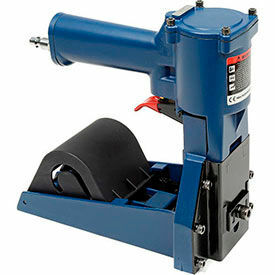 Pneumatic Carton Staplers Seal Cartons, Boxes and Packages Easily. These heavy duty staplers have 5 depth settings plus clinch adjustment. Staplers use 5/8", 1-1/4" x 5/8", and 3/4" staples. Staplers are used for high volume applications. Available styles are Pneumatic Carton Stapler, Pneumatic Coil Carton Stapler, Pneumatic Roll Feet Carton Stapler, and Air Clincher. Replacement Staples are sold separately and available in different quantities per box. Carton Staplers, Manual Provide Content and Package Sealing For Distribution, Assembly, Merchandising, and Other Applications. These carton staplers are designed to seal high volumes of packages to provide security and spill prevention while in transit. 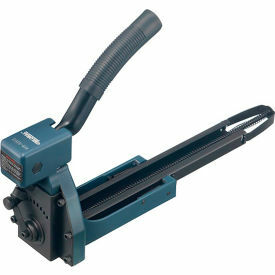 The staplers are lightweight and easy to operate minimizing user fatigue and increasing efficiency. The staple depth and clamping force are adjustable to support different package sizes and materials. The steel construction provides strength and durability for long lasting use. Available styles are Hand Operated Manual Carton Stapler, Manual Carton and Box Stapler, and Manual Stick Feed Carton Stapler. For use with 5/8" Staples, 3/4" Staples, and 1-3/8" x 5/8" staples. Available colors are Blue, Black with Blue Trim, and Black with Green Trim.